Congratulations on completing the alphabet! Nicely done! Don't forget ZENITH:The zenith is an imaginary point directly "above" a particular location, on the imaginary celestial sphere. As a name it means success and power! A good character name. What a great ride. I hope I'll zzee you soon again and, like that landsman of mine called Arnold, "I'll be back." Thank you! Happy Z Day to you, too, Madeline! Ooh I love Zizz, what a great word. Congrats on completing the challenge, yay! I think Zizz is neat, too. Ooh ... loved this post! Zinger is a great word. Woops, I see someone already added that word lol. Congrats on the A-Z challenge completed! Nicely done, Chrys! Of course your post works! Thank you, Kristin. I like to hear that. :) Happy Z Day to you, too! Z words rock!! Congrats on finishing the challenge! Zonk out. That's what I will be doing tomorrow. Chrys, thanks for sharing those Z words and encouraging us to use them today! I see a lot of bloggers in the A to Z challenge used them as well. I tried to read all the blogs I could and leave comments today. Now I have writer's cramp. My word is zilch. Need I say more? I'm a bit burnt out but still proud to have made it to Z along with you. Congrats and so glad to have found you through Shewrites.com and this challenging challenge. I've also noticed that other bloggers have used them, but I think this is the only time they get used. haha I understand what you mean by being burned out. I feel like that too. I'm going to be glad to have a break, but I do have 3 blog posts scheduled for the first full week in May. Zodiographer could apply to some writers, since it means "who who writes about animals." One of my stories in elementary school was a diary from the POV of a Peruvian guinea pig named Abby, who had a number of other guinea pig friends and a Myna bird living with her young owners. As an adult, I only have some pet characters, not entire books about these pets' lives! I'm fairly certain I've used about 1/2 of these in my writing somewhere. Great list! Great series all around. I'm ready for some serious Zzzz's right about now. :-) Congrats on making it to the finish line. I had no idea I had so many Z words I could have chosen from for today! I might have cheated on my Z word if I had read your post before I wrote. You have great suggestions. I have entirely enjoyed everyone of your posts during the challenge. LOL! I'm sorry I hadn't posted this sooner for you to cheat, but I still enjoyed your Z post. Actually, I enjoyed them all! We did it! And I love the word "zappy". Thanks for tuning in to my blog all month, Chrys. Yes, we did it, and thank you for the many wonderful Z words here. Yay! :D You're welcome and thank you! I like the sound of Zizz. Sounds like exactly what it is. Congrats on finishing. We did it! Thank you! Yes, we did! i was just at someone else's blog who featured the word 'zealous' and was saying how it is one of those words that I love yet rarely find an opportunity to use. Lots of great Z words here! Congrats! We made it! And better yet, we commented on every single one of each other's posts. :) Thanks for all the support and blog love. I feel like I've made a new friend. YAY!!!! I feel like I made a new friend too. Thank you! Now you have some great z words there - I'm particularly fond of zenith, not really sure why, but I've always like it :). Congrats on finishing the AtoZ, I've enjoyed your posts a lot. Also, thanks for visiting my blog, your comments have been a joy. Zenith does have a nice sound to it. Zephyr is a great word - and I agree, zealous is cool as well. SO glad I found your blog in this challenge! Congrats on completing the A-Z!!! I love Zither-- the challenge is to write about it today :). Thanks for all the writing-related posts through AZ! I can't wait to check out your challenge for Zither. Congrats on finishing the challenge Chrys. I'd go with the magical Zoltar machine from the old Tom Hanks movie: Big. Thank you! lol That's a good one. Great Z words and congrats on finishing. I love this, Chrys. You are always providing us with such useful advice and tips! This is the first time I've ever heard of the word "Zephyr." I think I might have to make a poem centered around this word because I love the feeling I'm getting from it... ahhh a west wind... how lovely! Oh no! I missed your Z. Better late than ever. We made it! I have to say, I don't think I've ever used most of these words in my writing, even in my freelance stuff...and I write thousands of words a day! Zany, zeal...those sorts of things just don't come to my mind readily! Congratulations on finishing A-Z, Chrys! Thank you, Loni! :) Zany does have a nice feel to it. Wow, you provided future A-Z'ers with quite the bounty of Z words for next year! I loved your A-Z. I think April is the month we all get lost! I didn't do it, but enjoyed following everyone else. Today is March 29. 2018. 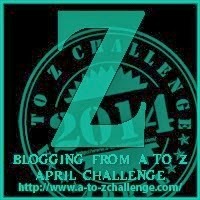 IZ hopped on your blog to check out how you did a-z blogging challenge. I am doing it this year for the first time. You have shared lots of great information and put a lot of time and effort into you blog posts. I have my theme and I have all but Z figured out. And wonders of wonders, you share Z words! Yay!! Thanks so much. I hope you stop by when you get a chance this April. I love Z words! And those are some real Zingers.